Multiplier action game with isometric view, inspired by the pop culture of the 80's. Hyper Jam not only allows you to play with other players, but also to play alone against AI. Production is the work of Bit Dragon studio. 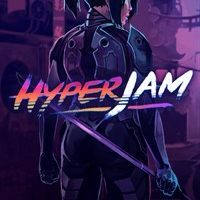 Hyper Jam is an action multiplayer game inspired mainly by pop culture of the 1980s. The production was developed by an independent studio Bit Dragon. Gameplay in Hyper Jam is based on dynamic and spectacular duels in various, relatively small arenas. By observing the action in isometric throw, we try to keep alive, at the same time gaining points for eliminating opponents or dealing damage to them; special bonuses are provided for those who succeed in defeating the leader or who stay on the battlefield last. In the course of the game we make use of an extensive and varied arsenal including both white weapons (like hammers or katan), as well as distance weapons (headed by a crossbow and a rocket launcher). Apart from that, between successive rounds we can choose one of a dozen or so pearls increasing our combat potential (they provide armor protecting against damage, speed up the movement of our character or even set fire to enemies hit; their effects overlap each other). Priority in their selection has the player who did the worst in the match, and the winner must be satisfied with what is left. It is worth remembering that during the game you should be on your guard not only because of the danger from the other participants of the game, but also because of the dangers waiting on the boards. These include the roof edge of a skyscraper in Miami (the crossing of which results in death) or even a train passing through the tunnels of the Tokyo Metro (which for the same reason is better not to stand on the road). Hyper Jam was created for multiplayer fun in the company of up to three players. The title allows you to play on the Internet (also cross-platform), as well as on a shared screen. Players playing alone can fight against AI-controlled bots. Hyper Jam has colorful, three-dimensional graphics. The struggle is accompanied by a synthwave soundtrack by such artists as Carpenter Brut, Dance With The Dead, Meteor and Vulta.